John Rock is in the Ranger District of Pisgah National Forest. 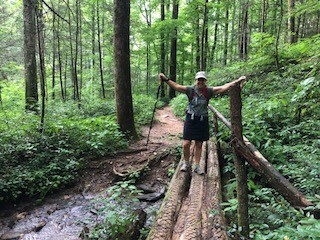 It’s near four waterfalls that can be access via the Cat Gap Loop trailhead, which begins at the Pisgah Center for Wildlife Education. Soon after you leave the trail head Cat Gap will head across a bridge and to the left. Follow the orange trail blazes, as you move upwards along the creek you’ll see a few primitive campsites on the left and right of the trail. The ones on your left are along the stream worthy of a pass by to see the fire rings and beautiful stream! There are even a few stream crossings where you can see some nice campsites on the other side. At about 1 mile up the trail you will hear a waterfall. Immediately look for a short trail to the left to Cedar Rock Falls. It’s a short and easily-missed trail (about 1/4-mile down to the waterfall). Head toward the sound of falling water and you will come to some rocks that you can carefully climb down to the base of the falls. After you return to the main trail, you will find another small waterfall near a camp site on the left. As you continue to climb the mountain on the main trail, you’ll cross a mountain stream several times on log bridges. At the intersection with the Cat Gap Connector trail, turn left onto the Cat Gap Connector. At the next trail intersection, turn left on the yellow blazed Cat Gap Bypass trail. This section of trail is about a 1/2-mile long and avoids the climbs to the highest point on the Cat Gap loop. This section is mostly flat as it follows the side of the hill. Soon is a four-way intersection. The Cat Gap Loop trail comes in on the right and leaves straight ahead. To the left, look for the “John Rock” trail sign and begin the steepest part of the trail. After reaching the top of the knob, you’ll head gradually down again toward John Rock. This is the highest point on the hike, at approximately 3,320 ft. in elevation. We cooked some chicken dogs and enjoyed the view! After you’re done soaking up the views, head along the edge of the woods to your right and pick up the John Rock Trail heading downhill. The trip back to the parking area is shorter, connecting to the Cat Gap Loop again (orange blaze) downhill. 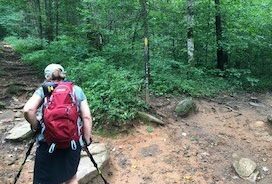 Return to the Pisgah Center for Wildlife Education parking areas the same way you came in or take a right at the sign post and take Cat Gap to the 3 more waterfalls on this loop! Grogan Creek Falls, Upper and lower Cedar Rock Falls if you have the time to add another 3-4 miles. Directions: From The Blue Ridge Parkway, take Highway 276 towards Brevard. After passing Looking Glass Falls, watch for FR475B on the right – pass that by and look for a paved road FR475, and turn right onto FR475 (very sharp turn). Watch for signs for the Pisgah Center for Wildlife Education, and turn left into the center. Park in front of the center.